So, I did have a lovely evening last night, with these two on the right and about 200 others. 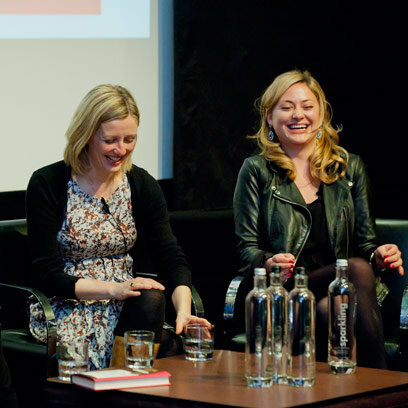 We were speaking at the latest Red Network event about being your own boss. Clare, on the left, founded Howies and now runs Hiut, an incredible denim company based in Wales. Kathryn, on the right in the I-want-that biker jacket, founded Decoded, a company that teaches coding in a day. Both amazing ideas and now incredible businesses, run by these gorgeous people. The evening was about believing that if you have a good idea, if you can find your story, then you should – as Kathryn said – just go for it. Perfect advice, indeed. I know, quite spenny, but a really beautiful wine. The winery is near the town of Hermanus, on South Africa’s Garden Route. We went whale watching there once, pre-children. I say we: the Husband went out to watch sharks. It was an awful day at sea, cost him a fortune and he didn’t see a single fin. Meanwhile, I stayed on dry land and sat on a bench overlooking the sea – book in hand – glancing up every now and again to watch the dolphins and whales pass by. Oh, how we laughed. Anyway, back to the wine. This is oaky, but with enough pineapple fruit for it to work. Lovely stuff, especially with our fish pie the other night. Fighting the urge to call it Olivia. So I bought this on label alone – c’mon, who hasn’t? – and loved what was inside. A case of style and substance, as it were. This is made from mainly Grenache grapes, with a Rhone-style cocktail blend of other grapes thrown in for good measure. But it does have that lovely Grenache fleshy fruit thing going on, with a sprinkling of spice. (I once put cumin in a chocolate mousse when I supposed to use allspice. Apparently I managed to make a pudding taste of armpit). Anyhoo, with glass in hand this is one way to limp from January to the slightly more perky February, especially when there’s stew and mash involved. Wines for haggis?? Still got some you know! Ha ha…what does Pippa say? Anyhow, I'm definitely in the market for stocking up on red, and I too am a sucker for a pretty label, so off to check that one out! Maybe he saw how inadequately small my fridge actually was?! And I know, does make a difference. To me, at least. Your write-up on the Chardonnay made me laugh out loud! I can just picture it and I would SO call that wine Olivia….if it's the one that that you want. Ooh, ooh, ooh honey! Going to treat myself to the Les Dauphins this weekend – have been on the Cancer Research UK "Dryathlon" during January so this will be my first drink and I may as well make it a recommended one! Bought this this morning to try, due entirely to recommendations here. Wouldn't have done otherwise I suspect. Like it very much indeed, although it is 2011 rather than 2010 (£5.99 @ Waitrose). Still delish. Off to get more before offer ends. Thanks for the tip off. So glad you like! Pleasure…v kind of you to stop by.